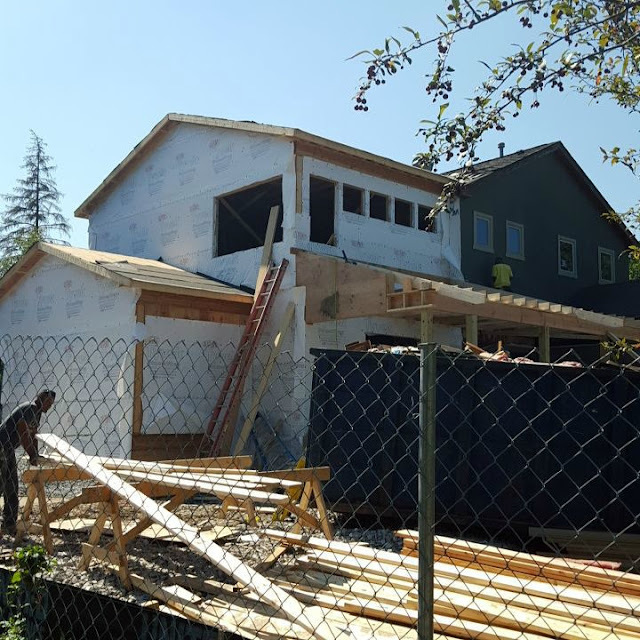 A few months ago on Facebook, I shared a photo of the green stucco two story home below at the early stages of a renovation and addition. At the time, It didn't look like much and I had just been asked to consult on the project. 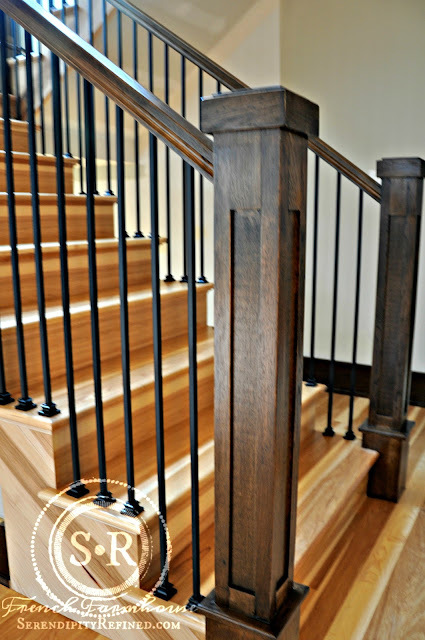 Today, I'm sharing the "after" photos of the inside of this craftsman style residential remodel. I got involved in this project in the middle of the reconfiguration when the owner was beginning to make selections for the exterior.. I really wish that I had some "before" photos but you'll just have to trust me when I say, "you wouldn't recognize the place". 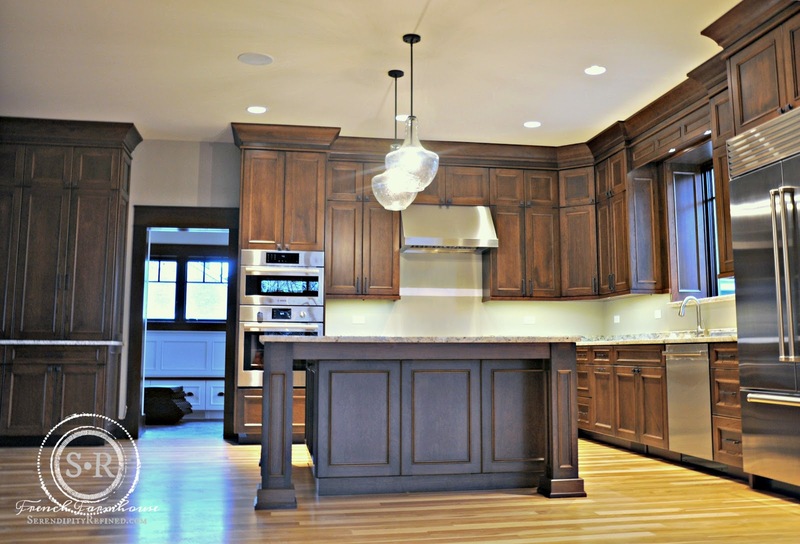 It's often difficult to imagine that a residential remodel that is done well can have all of the same features and conveniences of a new build for less money. This home was originally built in the 1960's. It's situated in a great neighborhood on a great lot but the space in the house wasn't working for a young family with an active lifestyle. The owners told me upfront that they love open floor plans, simple, clean lines, and they emphasized to me that they wanted a look that wasn't "like everything else that you see but will fit into our established neighborhood". She told me that she loved the simplicity of craftsman and mission styles but didn't want it to feel dark. 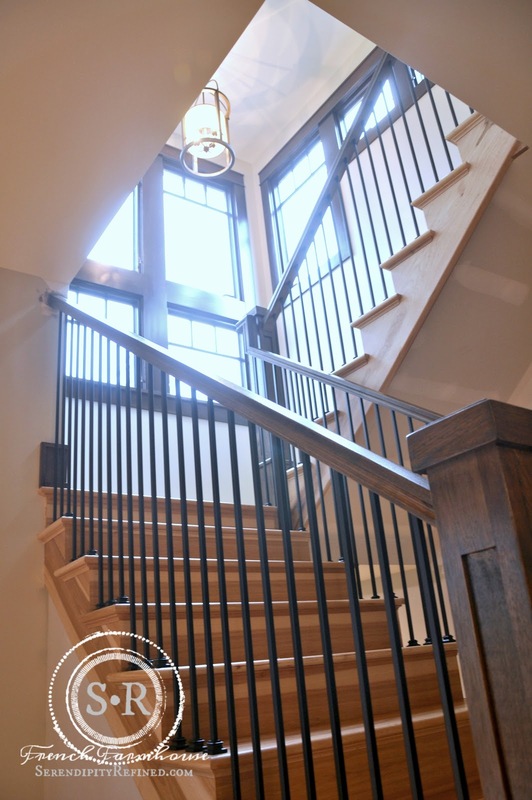 This project started with a great architect who worked within the original footprint but reconfigured the space to allow for better traffic flow. Also critical to a remodel of this scale is a builder who understands the mechanics of a remodel versus a new build because it's an entirely different situation that presents a unique set of challenges. and b) at some point my family would like it if we'd stop moving every few years because I want to try decorating in a style that I haven't done before. So far, there has been a Victorian, a Cape Cod, a Nantucket shingle and now, a farmhouse. Truth be told, I'd still love to try a Cotswold Cottage but let's not mention that to my family. 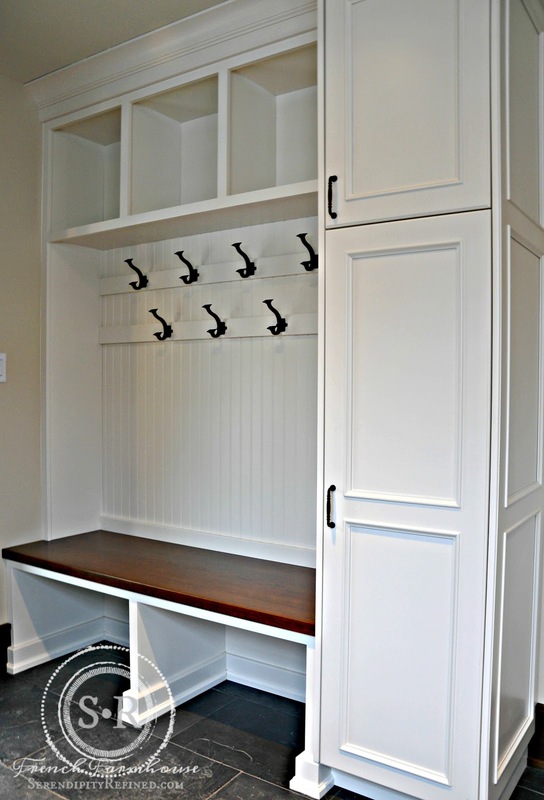 Right now, I'm seriously considering moving into this mudroom/laundry room which is just off of the kitchen. Isn't it amazing?! From the wood seats to the rows of hooks, to the slate floor and the farmhouse sink; if I had a room like this I wouldn't mind doing the laundry...well, maybe not as much anyway. This craftsman style home embraces clean lines and straight-forward, minimalistic design. 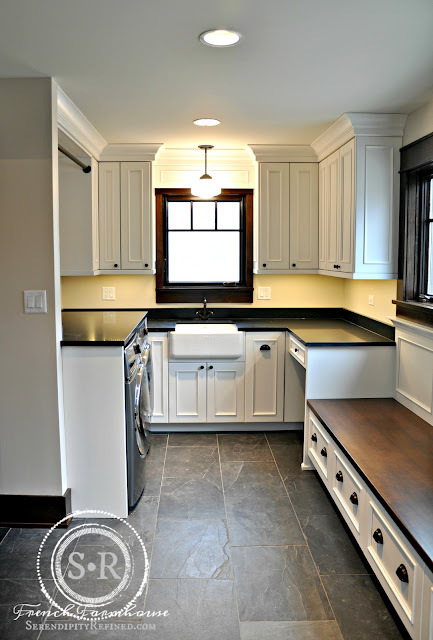 A mix of dark stained alder wood doors and cabinets is in stark contrast with white painted trim throughout the home. Rather than traditional mission/craftsman elements like stained glass and heavier earth tone colors, this home has a more modern take on the style using modern light fixtures in rustic finishes, and elements like simple black iron spindles combined with craftsman style wood newel posts. 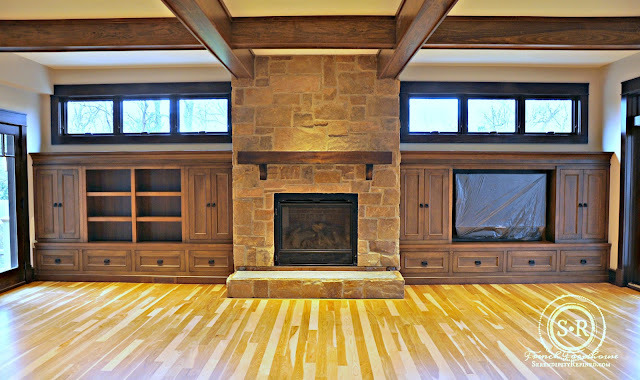 Craftsman style window layouts and mullion patterns in dark tones contrast with light colored hickory flooring (left natural) as well as rustic stone and tile in neutral tones provide just the right amount of visual interest and mix of styles to make this home feel warm and welcoming while maintaining an overall feeling of calm. 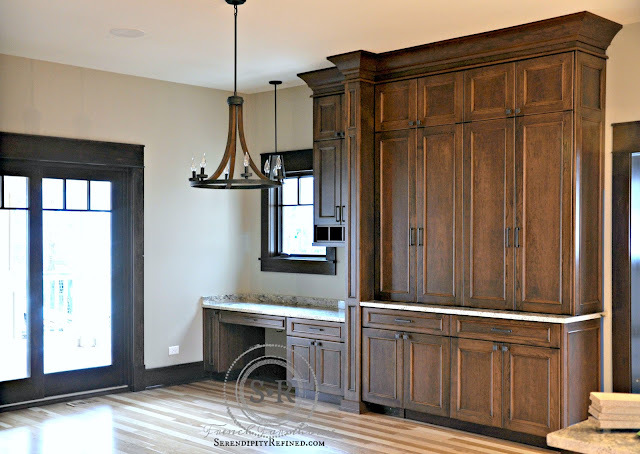 The style of the cabinetry is kept consistent throughout the kitchen, mudroom and baths (except for one bath which I'll show you later in this post). 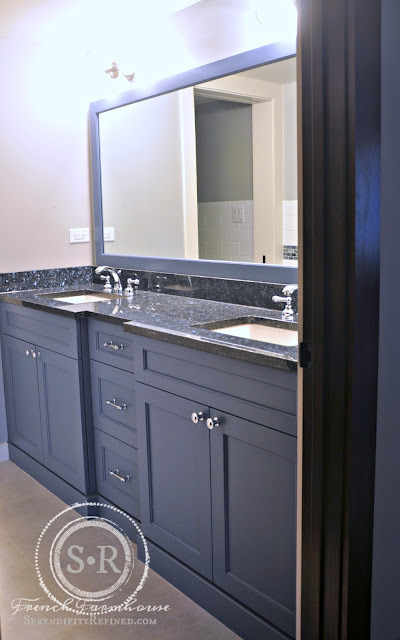 Flat paneled cabinet doors with a single bead along the edge provide a softer feel and using alder wood or painting them provides an up to date take on traditional. Saving more expensive glass tile for only the most visible part of the tub/shower; the back wall, and combining it with less expensive, traditional white subway tile on the ends allows for the creation of a focal point without breaking the bank. Another great way to use glass tile as an accent is to create a wide band of tile to use as an accent. 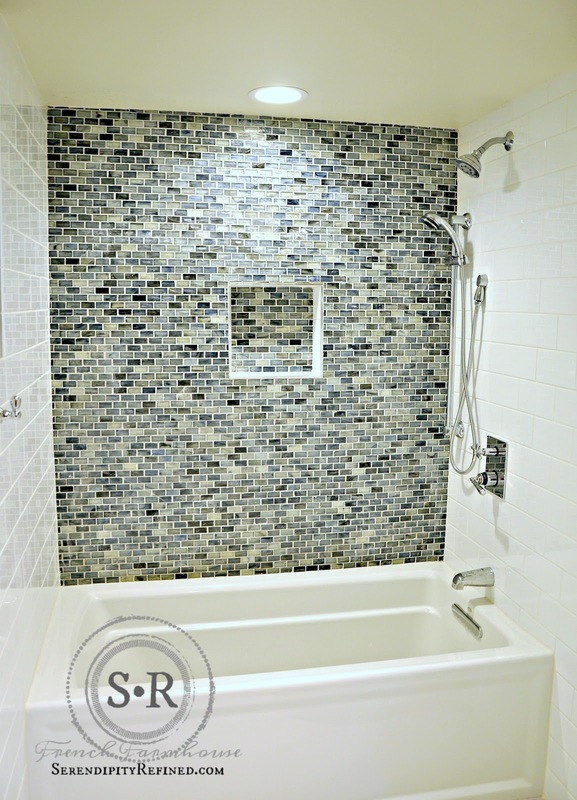 This treatment was used in the basement bathroom by running vertically to create visual height as was done in the shower or a horizontal strip as was done in the rest of the bath. 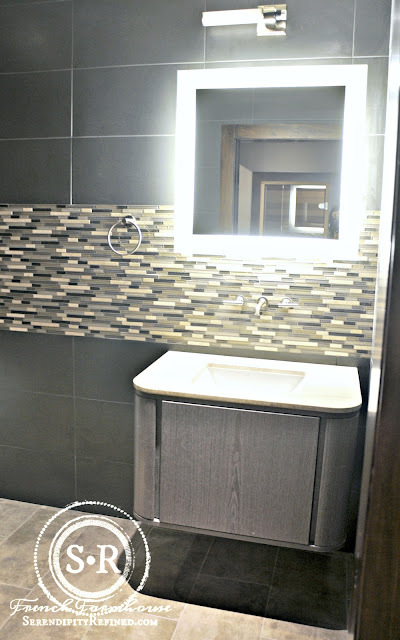 Glass accent tile was combined with large format rectangular tile for a clean lined, modern look that is a decided break from the style of the rest of the house but works well in the space..
Whatever your style, the goal of good design is that your home should be a reflection of you! 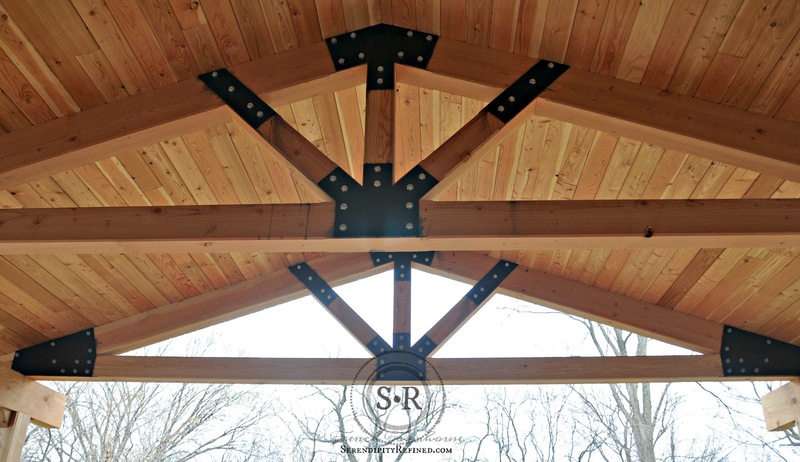 I hope to have some exterior shots to share with you soon but in the mean time, let me leave you with these images of the covered porch on the back of the house just off of the family room. Incredible....right?! Those huge rustic beams may very well be my favorite part of this home. 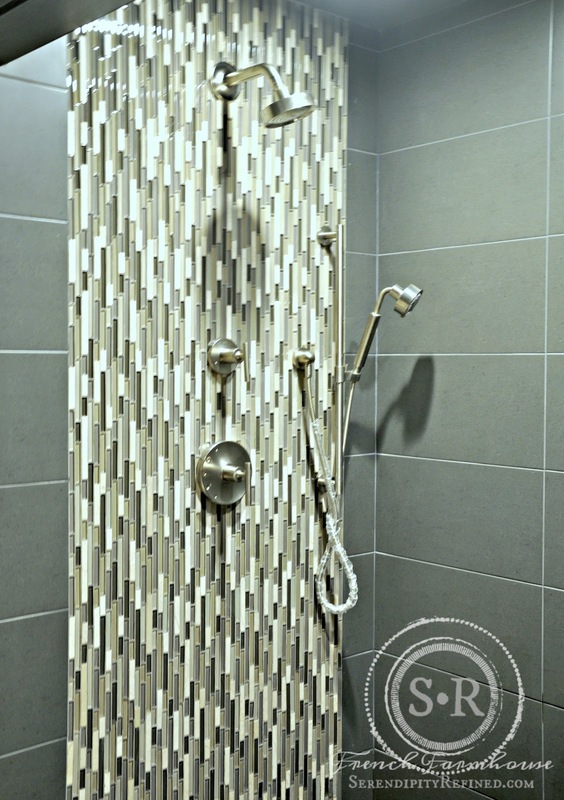 I'm looking forward to using something similar at the farmhouse...unless I change my mind. 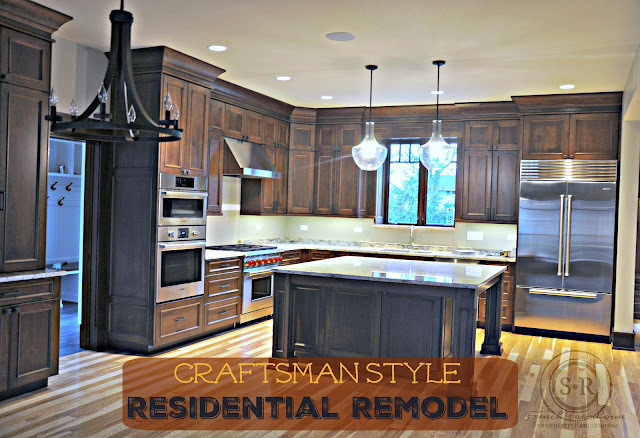 There are so many things that I love about this craftsman style residential remodel. 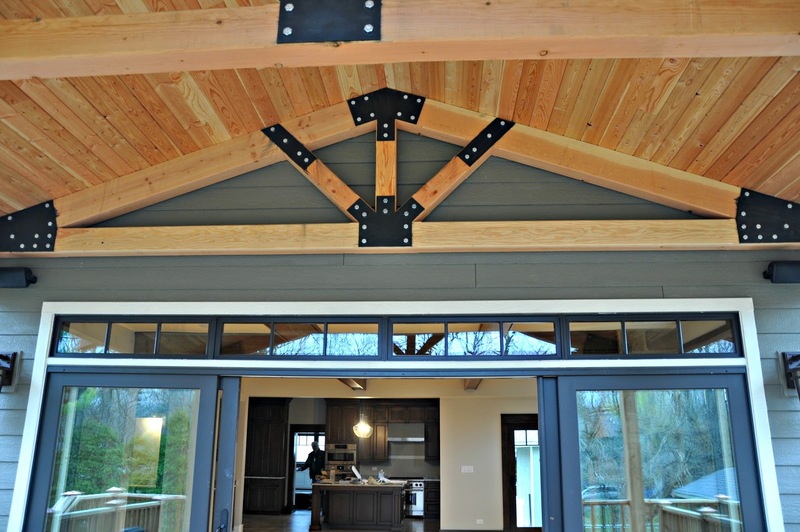 From the beams to the doors to the open floor plan. To me, the best part of this home is that it's not a brand new house. The owners chose to remodel rather than to tear down. 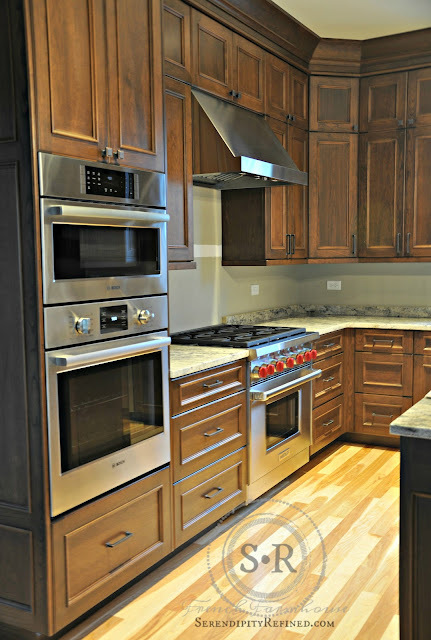 Now, they have a beautiful, energy efficient home, that has been brought up to date for their active family. Next week, an update on progress at the farmhouse!